1. First make the tomato sauce - Drain the whole peeled tomatoes, Place tomatoes, olive oil, salt and pepper and oregano in a blender and blend until smooth but still a little texture. Taste the sauce and adjust seasoning if necessary. Will last about a week in the fridge. 2. For the Flatbreads - Mix all the ingredients together (accept for the olive oil) in a bowl first with a spoon then get your hands in there, till it forms a dough. 3. Scatter the flour on a clean surface and knead the dough (add more flour if needed) for a minute or so till it forms a nice smooth ball. Cut the ball into 4ths. 4. Heat the oven to 200c. Dust a rolling pin with flour and roll out one of the pieces of dough as thin as you can add your topping..
5. For the leek and pork – Heat a little oil in a pan and add the leeks, garlic, fennel seeds and chili flakes and saute for 2 minutes, add the sausage meat, breaking it up with a spoon, fry till browned then take off the heat. Take a couple of spoons of the tomato sauce and spoon onto the flatbread base, scatter over the pork mixture, sliced fennel, mozzarella, drizzle with olive oil and season. Place in the oven for 5 – 10 mins, scatter with fresh oregano and serve. 6. For the lamb – Mix together the lamb, coriander, cumin, smoked paprika, garlic, crushed chillis, salt and pepper. Heat a little oil in a pan and add the lamb mixture, cook till browned. 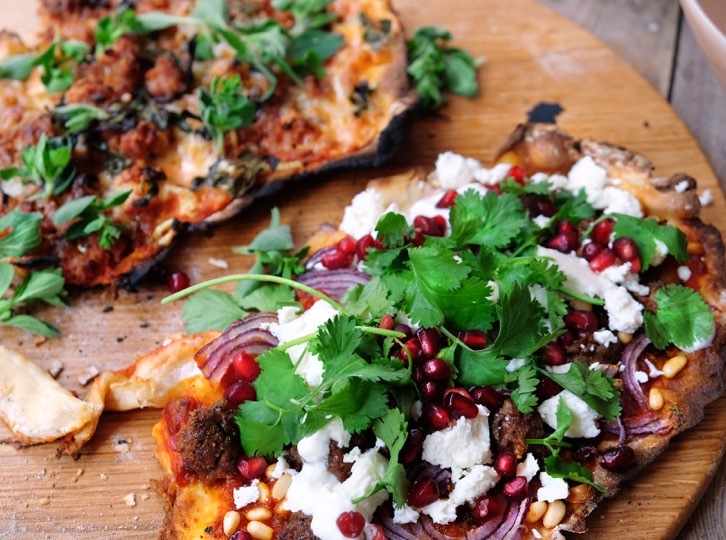 Spoon some of the tomato sauce onto the rolled out pizza base and sprinkle over the lamb mixture, add some red onion and pine nuts and place in the oven for about 5 minutes, take out and sprinkle over some feta, fresh coriander and pomegranate seeds and serve.